Our 2015 conference attracted 300 people from 6 states, 25 universities, 25 nonprofits, 50 companies, 90 Massachusetts communities, and more. National Grid Here with you. Here for you. 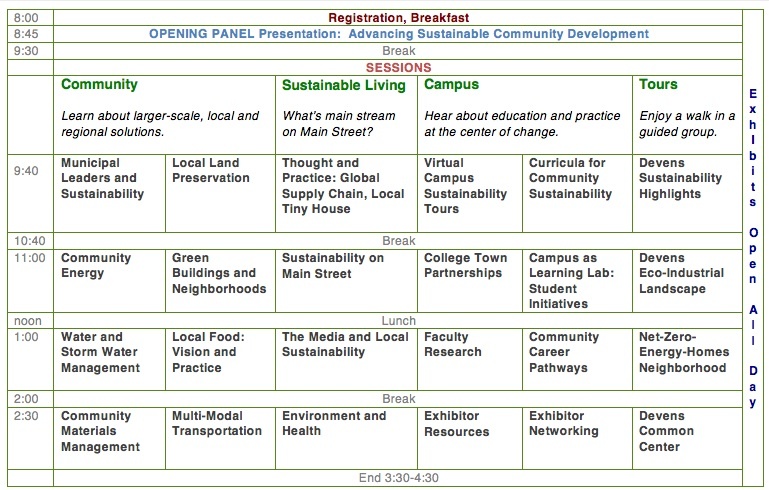 The annual Sustainable Communities and Campuses Conference connects stakeholders from communities, campuses, companies, and nonprofits. Everyone wanting to learn about best practices, current trends, and resources will find this conference timely, practical and valuable. Benefit from advance registration: $60. Registration after March 19 is $75. Students are $45. Groups of 5 or more, $5 discount. Seniors are $60. Walk-ins if available, $90. This registration fee covers keynote presentation, breakout sessions, exhibitors, lunch, breakfast, networking, and FREE book raffle. Advance registration is recommended as previous conferences have filled. Significant opportunities, achievements and plans advance sustainability. City leaders champion policies, practices, and metrics of success. A successful land conservation strategy includes preserving large green corridors for walking and biking trails; it requires vision, advocacy, and an abiding love of nature. A virtual tour of three campuses show award-winning energy and food initiatives. Exceptional curricula, programs for sustainable urban environments, and extraordinary student projects exist. What do global-supply-chain transparency and tiny-house living have in common? They offer more sustainable living choices to consumers. Have a first-hand look at sustainable development in Devens: low-impact storm water management, green buildings, renewable energy, and transportation. Learn about local regulations and guidelines that helped “green” Devens development. Hear updates on Massachusetts communities: micro grids, green municipal electric aggregation, net zero energy, energy-data transparency, community solar, and resources. Buildings are our largest consumer of energy and materials. Designing better neighborhoods lays a foundation for more sustainable living. Net positive energy homes produce more energy than they consume in an average year. Hear from leaders who are bridging community and campus initiatives that lead to both workforce and sustainable development. Four students describe their exceptional projects on campuses and in communities. Hear about community initiatives, partnerships, and advocacy. Groundwork Lawrence leads environmental and open space improvements, healthy food access programs, youth education, employment initiatives, and community programs in Lawrence. HEET weatherized thousands of buildings and led the Squeaky Leak Project to map natural gas leaks on public streets. Boston Climate Action Network (BCan) is taking action for climate justice. Transition Towns are engaging people to build community resilience. Take a walking tour of Devens to learn about limiting environmental impacts of development and embedding green building features into projects. See for yourself the changes 20 years of sustainable development have brought to Devens. Hear about historical changes, water infrastructure trends towards efficiency, and local storm water management solutions. Learn about research, policies and practices for a more sustainable food system in New England, such as: carbon sequestration, a community farm, and the New England Food Vision. What motivates our emotional attachment to places? 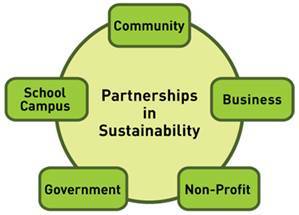 How would students address sustainability challenges on campus? Hear from faculty and authors exploring challenges and solutions. Special career pathways make our physical environment more sustainable and downtown businesses thrive. Hear about technical high schools and MA community college career development initiatives. The media has an important role in our communities. It can provide transparency and access to information, and actively engage the public in reporting community news. Visit a nearby net zero energy neighborhood where homes produce more energy than they consume during the course of a year. Hear from a renown builder who created this neighborhood and several others in Massachusetts. Carter Scott President, Transformations, Inc.
Good materials management begins at the community level. Learn about a large commercial composting facility in Marlborough, The Great Exchange which repurposes over 50 tons of materials annually in Devens, and Casella’s waste-streams-to-resources solutions on campuses and in communities throughout the Northeast. Should we invest in highways? bike lanes? walking routes? mass transportation? Mobility is evolving and communities are striving to keep up. 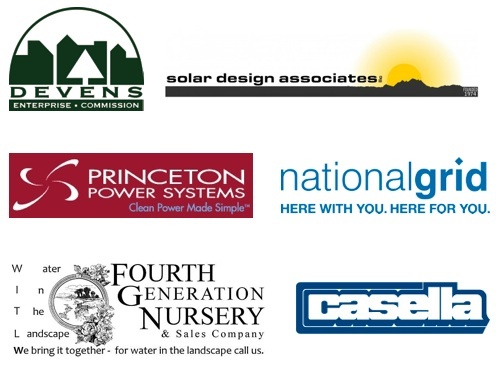 Our exhibitors will briefly introduce themselves and resources that help us live more sustainably. Enjoy networking after the introductions. The health of the community depends on the health of the environment. Learn about public health assessments, community investigations, and legislation for environmental protection and toxics reduction. Tour the Devens Common Center with the Operating Manager to learn about sustainability features of the conference center and nearby hotel. NOTE: Walking tours begin and end at the Devens Common (Conference) Center.